I've been trying to write this blog post for a few days, trying to figure out how to put 2016 into words. It was a funny old year, I mean in general it brought around Brexit, Trump being voted as president and a ton of celebrity deaths some of which broke my heart all of which have made it very odd to start with. Personally though it's been weird, there were a few points where I felt so lost and down it was awful, there were health scares and illness and a little bit of depression but as bad as some of it was the good things really overshadow them. The first few months of 2016 were a little hit and miss to be honest not a lot happened. I moved house, I turned 22 and that was pretty much it until May. May was the start of things going uphill and downhill at the same time. I had Slam dunk festival and nights out with my best friends but my granda got ill, then came the summer which was spent waiting for news about my granda while planning festivals and trips with my friends. It was weird having things to be happy and excited about like passing my theory test and booking my practical test, going to Leeds festival and of course booking Disneyland all the while being a bit of an internal emotional worried mess over my family. I did get to spend a hell of a lot of time with my friends and family in 2016 which was one of my goals. I made sure I saw them at least once a month and it was lush, I kept up with uni friends as well which was nice. Mostly though, the best bits of 2016 came in November and December which is typical having to wait all year for the good bits! Haha. 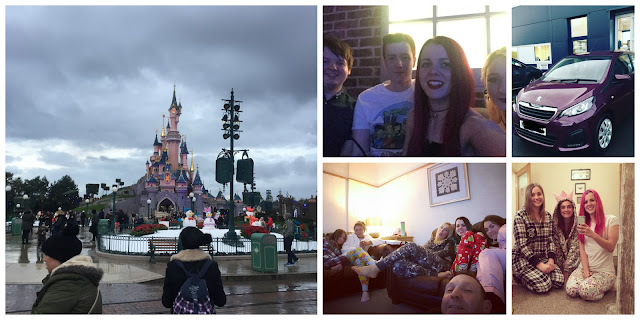 In November me and Abbey finally went to Disneyland Paris after wanting to go since our first year of uni and it was honestly the best trip ever, I can't wait to book up to go back again this year! The week after I got back from Disneyland I had two gigs with my friend Lewis we saw Piece the veil and then Biffy Clyro both were amazing. Especially Biffy I got a drum stick and we were at the barrier and it was just an unreal show, a few days after Biffy I went to Edinburgh for the night with my sister which was super fun. Another few days later I passed my driving test! My driving test was something I never thought I'd achieve especially not this year, my anxiety was ridiculous, luckily I finally got some medication and I was able to relax enough to sit a test and pass which was mental, then somehow a few days later I got myself a car. Mental or what. Like I still can't believe all that happened in the space of a month, I feel so ridiculously lucky and grateful. Looking forward at 2017 there's not a whole lot I'm aiming to achieve. I'd very much like a lose a little bit of weight and tone right up, I'd love to add a few tattoos to my body and finally try a yoga class. I'm also aiming to get a more sleep, I physically can't survive much longer on only 4/5 hours a night haha. I'd love to do more travelling if I can afford it mostly though I plan on enjoying it, I feel like I spent way too much of 2016 worrying and stressing and I would just love to be more relaxed this year so fingers crossed I manage it. So there we have it, I'm backing writing rubbish on the internet and I plan on sticking to my 2 posts a week minimum this year. I'm really excited to get my blog up and running properly again along with whatever else 2017 brings. I hope you've all had a lovely Christmas break and that 2017 brings what you want! Feel free to share you goals for the year I'd love to hear them!